Make sure that drivers observe the speed limit in various locations in your property. Our range of speed limit signs by location cater to speed limit restrictions in parking lots, school zones or your village area and prevent accidents. • Reflective aluminum signs are visible in the dark, great for outdoor traffic and last for up to 10 years. • Heavy duty aluminum signs outlast ordinary plastic signs and resist rust, chemicals and water. • Enter the speed limit and property name to make your own customized speed limit sign! • Pre-drilled holes on 4 corners allow hassle free installation. 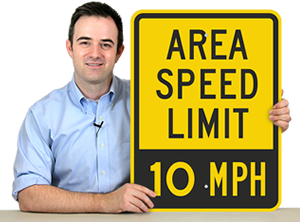 Simply click on a template and use the custom wizard to create your own Custom Speed Limit Signs.